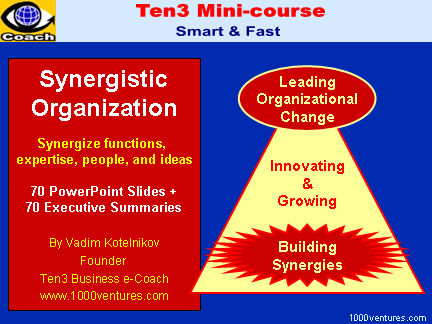 "Winning Organization", "Synergistic Organization", "Innovation-friendly Organization"
out of about 10-million-wide (!!!) competition! 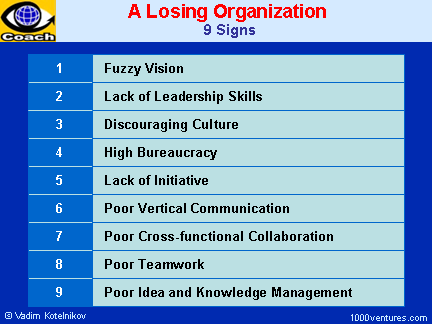 Fuzzy Vision: corporate vision and mission don't inspire people; lack of strategic alignment; people don't know where the organization is going and what it is trying to achieve in the future. Lack of Leadership Skills: fear of change; leaders lack entrepreneurial spirit; leadership style on the part of management is either too directive or too hands-off; managers do not lead, they just administrate and micromanage; weak leadership development program. Discouraging Culture: no shared values; lack of trust; blame culture; focus on problems, not opportunities; people don't have fun at work; diversity is not celebrated; failures are not tolerated; people lose confidence in their leaders and systems. High Bureaucracy: bureaucratic organizational structures with too many layers; high boundaries between management layers; slow decision making; too close monitoring of things and subordinates; too many tools and documents discouraging creative thinking; bureaucracy is tolerated. Lack of Initiative: poor motivation and encouragement; people do not feel their contributions make a difference; management fails to engage the organization effectively; people work defensively and not creatively, they do their job, and nothing more. Poor Vertical Communication: people have no clue of the big picture and do not feel that their contributions are important; too much uncertainty; people don't know what top-managers are thinking and planning. 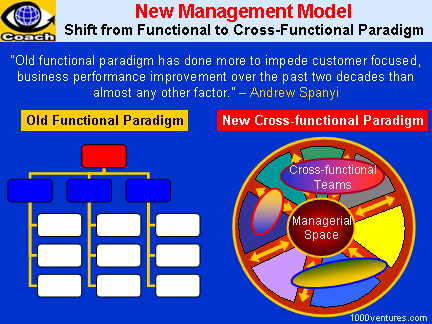 Poor Cross-functional Collaboration: functional mindset; lack of cross-functional goals and cross-functional collaboration spirit; functional, no enterprise-wide business process management; no cross-functional management committees; lack of or powerless cross-functional teams. Poor Teamwork: no organizational commitment to team culture; lack of shared and worthwhile goals; weak team leaders; team members who don't want to play as part of a team are tolerated; teams are too large; lack of shared rewards. In far too many organizations, senior management's traditional functional mindset represents one of the most significant barriers to change. Indeed, there is reason to believe that the traditional functional paradigm has done more to impede customer focused, business performance improvement over the past two decades than almost any other factor. This way of thinking stands in the way of executives understanding and improving the flow of cross-functional activities which create enduring value for customers and shareholders. It promotes the type of thinking that impedes the effective deployment of enabling information technology. It promotes also 'silo behavior' and turf protection, and an undue pre-occupation with organization structure. This mindset contributes to the mistaken belief that if it was somehow possible to properly define the boxes on the organizational chart, and fill in the names of the "right" people in the key boxes - then the organization's performance will automatically improve. Yet, little is further from the truth.